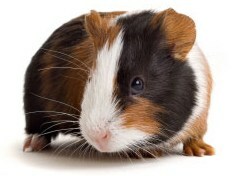 1: did you know guinea-pigs have 4 toes on their front paws and only 3 on their back paws? 2: they don't have fur, they have hair! 3: they purr when they're happy, and chatter their teeth when they're mad! 4: their teeth don't turn yellow like hamster's! 5: they are very smart and can learn to beg! 6: their ears can change tempuratures! 7: the short hair kind don't need baths! 8: they don't need to sleep that often, they only take little naps of about 2 minutes each! 9: they can't see well so they smell or taste their way around!